Tracking company MUSO has recently published its annual report for 2017. The key headlining fact taken from its monitoring last year is that online "piracy is more popular than ever," reports TorrentFreak. In 2017 MUSO recorded more than 300 billion visits to pirate sites. The tracking firm collects data from "tens of thousands of the largest global piracy sites," says TorrentFreak. 2017's copyright infringing site visitor numbers are 1.6 per cent up on 2016. 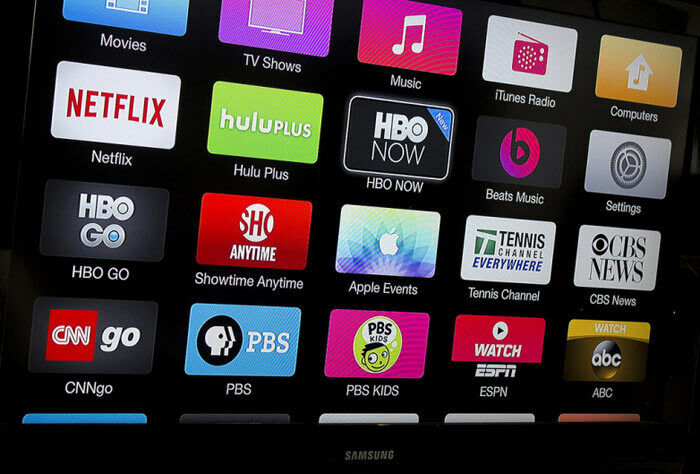 The observed uptrend is seen despite a number of moves by the content industry, governments and ISPs to reduce the demand for pirated movies, games, music and so on. For example, here in the UK we have access to reasonably priced streaming for TV and movies from the likes of Amazon, NowTV and Netflix; for Music there are services from Amazon, Google, and Spotify; and for games there are vast numbers of reasonably priced titles on Steam, GOG, and Humble bundle. (Sorry if I have missed out your favourite service). At the same time there is a pincer movement here in the UK with major ISPs clamping down on well known pirate sites, making them not directly accessible via many home broadband lines. As you can see in the piracy sites visits per country league table (above) the UK still manages to squeak into 10th place with 9.0 billion visits in 2017. 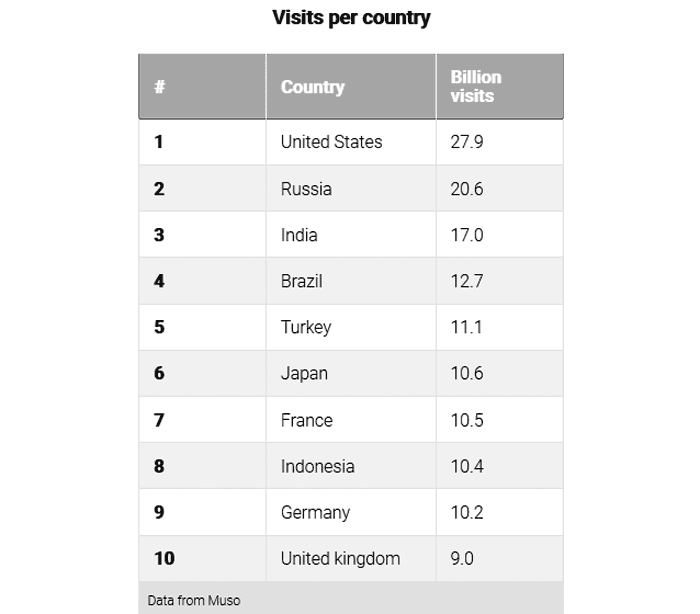 That's nearly twice the number of piracy site visits for China, according to MUSO figures (perhaps it is missing some popular Chinese sources). Digging into the data, MUSO says that 53 per cent of piracy sites are visited for their hosted streaming video content. That format is much more popular now than torrents or direct download portals. TV shows remain the most popular target for pirates with 106.9 billion visits last year, followed by music (73.9 billion) and film (53.2 billion). In 2017 MUSO noted that mobiles overtook computer TV piracy viewing (moved up to 52 per cent). If you are wondering about the popular 'pirate streaming boxes' people use attached to their TVs, it is surprising that data for these is not included in MUSO's latest figures. These Android boxes seem to be popular, so the piracy of TV, movies, and sports events etc must be even worse than MUSO's headlining figures suggest. MUSO's CEO reckons that content industries should consider the trends seen in its data and act to monetise the vast audience that still feels paid-for-options aren't good enough. For $15pcm extra Cox Cable provides a service with "reduced lag, jitter and ping spikes". Epic CEO Tim Sweeney said 88 per cent for developers was the golden figure. MUSO's CEO reckons that content industries should consider the trends seen in its data and act to monetise the vast audience that still feels paid-for-options aren't good enough. Or that the content they're actually asking money for isn't worth the paper it's printed on to begin with…. !! Well, once big corporations like Sky started to make people pay for content they don't want to watch, to cover the costs of silly license deals…..and then shows and sport got fragmented so that you need to subscribe to multiple premium sites……all against the backdrop of austerity…..piracy went up? Who'd have thunk it? I would have thought it difficult to get accurate stats for file sharing what with VPNs, proxies, people using lesser know sites, and probably a whole host of other things. The odds of piracy going down is pretty slim in all honesty until the media companies come to the realisation that people don't like drm, geo blocking (netflix for example has tonnes more stuff we can't see in the UK but can in the US), delays depending on where you are in the world (ie being shown a day plus later so twitter etc has ruined it for us), time restrictions on how long it's available for or streaming service exclusivity so we need to sign up, sometimes to multiple services, just to get access to that ‘one show’ we want to watch. And maybe it's me but I kind of prefer to ‘own’ stuff rather than pay to be allowed to access a stream of something that can be removed at any moment in time if the streaming service doesn't want to keep paying to show it.